Everyone loves to discover beautiful colorful birds visiting their garden! Get ready to welcome a life-size pair of Robins that will bring you endless joy! 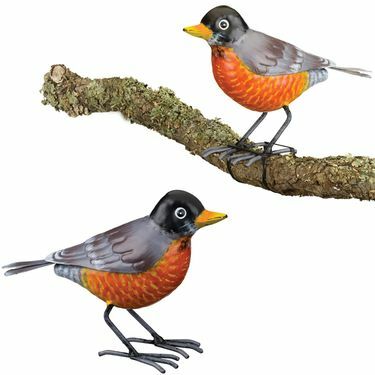 Sold in pairs, our Robin Bird replicas are hand-painted with realistic details. These birds are crafted to stand upright on any flat surface, but they also come with a mounting rubber band to attach the birds to tree branches as desired - so much fun! Sitting on any garden wall or perched discreetly on branches in your garden you will love these new metal visiting Robins! Size: 7.5" x 5.75"H each, Metal.